2019: Tuition $18,500.00, Registration $50.00, Pivot Point Books, Equipment and Lab access $1,800.00 (includes tax and shipping). Please contact the campus for a complete list of 2019 class start dates. The Oak Forest campus offers a full-time day schedule, a part-time 4 day schedule and a part-time 3 day schedule. Students that attend classes 30 hours per week normally complete their coursework in 52.5 weeks. Students that attend classes 19.5 hours per week normally complete their coursework in 81 weeks. Students that attend classes 20.5 hours per week normally complete their coursework in 77 weeks. Full-Time Day Schedule: Wednesday, Thursday, Friday 9:00am - 5:00pm & Saturday 8:30am-4:30pm. 30 hours per week for 50 weeks. Part-Time 4 Day Schedule: Wednesday thru Friday 9:00am - 1:00pm and Saturday 8:30am - 4:30pm 19.5 hours per week for 77 weeks. The New Lenox campus offers a full-time and part-time day schedule. Students that attend classes 35 hours per week normally complete their coursework in 45 weeks. Students that attend classes 19 hours per week normally coursework in 83 weeks. Full Time: Tuesday, Wednesday, Friday 9:00 a.m. – 4:30 p.m., Thursday 12:30 p.m. – 8:00 p.m. Saturday 8:30 a.m. – 4:00 p.m. 35 hours per week for 42.5 weeks. Part-Time Days: Tuesday, Wednesday & Friday 9:00 a.m. - 1:00 p.m. Saturday 8:30 a.m. - 4:00 p.m. 19 hours per week for 79 weeks. Have evidence that verification of a foreign student’s high school diploma has been performed by an outside agency that is qualified to translate documents into English and confirm the academic equivalence to a U.S. high school diploma. If attending under a training agreement with a government agency, school district, and/or other entity, meet the admission requirements set out in the training agreement and/or applicable state licensing or certification regulations. Students must be 16 years or older. a. Complete 1500 clock hours. e. Achieve a Level Four on Clinic Totals. g. Made satisfactory payment arrangements on any financial obligations to the school. Becoming a professional cosmetologist requires customer service. 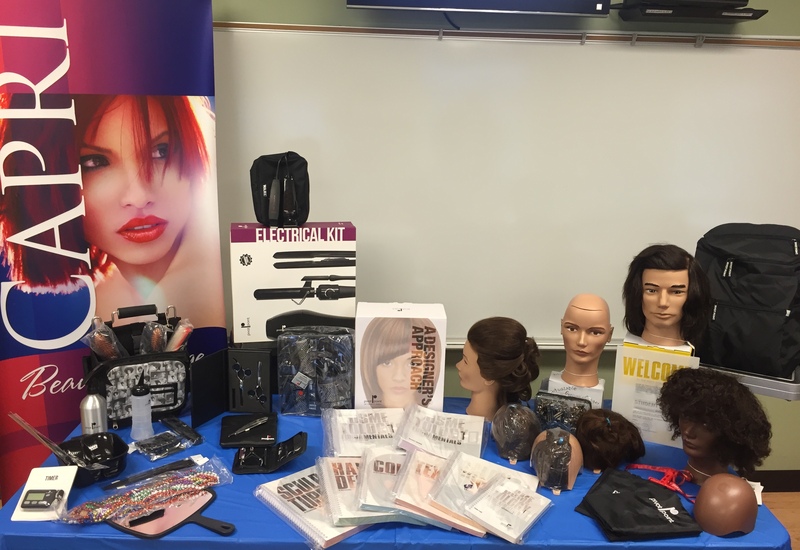 The development of a clientele and the sale of retail products are required of all students enrolled in the basic cosmetology program. Capri Beauty College students will be educated in the art of selling service and products and are expected to establish a client base from existing school clients as well as family and friends. On occasion, students are required to provide a model for class credit and/or competition. Cosmetology License Renewal Cosmetologists licensed in Illinois are required to complete 14 CEU hours every 2 years. Cosmetology Net Price Calculator for New Lenox. Cosmetology Net Price Calculator for Oak Forest.